We just recently begun building an Exchange 2013 DAG to support out email environment. This is part of an internal shift to Lync 2013 and Exchange 2013 for unified communications. We followed Microsoft instructions on building my first 2013 machine, migrated a single test mailbox and started testing. We found no mail flow between the Exchange 2013 and Exchange 2010 environments, all email sent from 2013 OWA or Outlook was just sitting in the drafts folder. In fact even if I emailed within mailboxes on the 2013 mail database they would also stay in drafts. Upon investigating this problem there was a failure of the “Microsoft Exchange Mailbox Transport Submission”, “Microsoft Exchange Transport” and “Microsoft Exchange Frontend Transport” services. Windows application event logs showed the following errors when trying to restart the “Microsoft Exchange Mailbox Transport Submission” service. There is also another event log with some more telling information. It is indicating that the DNS component was failing to start in a timely manner. We checked and double checked our DNS, no issues. 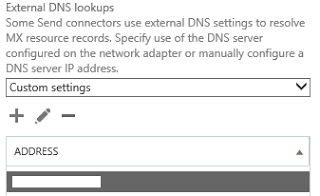 We also followed a number of blogs that indicate you need disable IPv6 and manually select the network adapter under DNS lookups on the Exchange server properties. We did this to no avail, however the actual resolution wasn’t far off. This seems to be a bug with a .NET 4 module Microsoft.Exchange.Net.ni.dll. Selecting “Custom settings” bypasses this .NET bug.